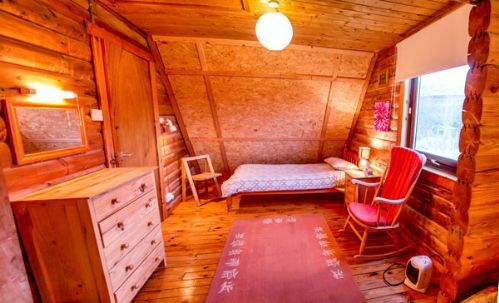 Ian’s Lodge is a comfortable, wooden house, set high up on the hillside, overlooking Kilchoan Bay. Enjoy wonderful sea views over the Sound of Mull from your balcony or climb over the stile at the back to explore heather-covered hills. Set in the crofting village of Kilchoan it is a short walk from a friendly, local pub, shop, tearoom and regular ferry sailings to Tobermory, on the Isle of Mull. It was a third stay at a Steadings Lodge for me and the wife, the fourth for our daughter, and the umpteenth of my Sister and Brother in Law. We will be back again. Ardnarmurchan is a beautiful place and Steadings provide comfortable and well priced accomodation for families. Kilchoan is a small friendly village, with a good pub with decent food. It has a shop that stocks most things that you might need on a daily basis. The Isle of Mull is only a short ferry journey away, and that has an excellant choice of shops, restaurants and pubs. This is a pleasant chalet set in a peaceful location . It is comfortably furnished but basic. Other chalets seemed to have more 'finishing touches' such as seating in the verandah, tubs of flowers at the entrance etc. Although the kitchen, bedroom and bathroom were very clean, there were lots of cobwebs on ceilings and down the sides of some pieces of furniture. We reported a jammed sink plug in the bathroom at the beginning of the week and it still wasn't fixed by the end of our stay. However, the manager was very friendly and helpful. Altogether a reasonably priced place to say especially with children, but I would have expected a little more luxury for the price really. Great location but scruffy cabin. Lovely position. However the cabin was shabby and dusty and had seen better days. The shower was poor and the kitchen equipment, glasses and cutlery were insufficient for a full house but adequate for our needs. Limited but as expected for the location. Good location but property a bit tired. Location is great and we had a good holiday but the property needs some TLC. Rugs and flooring are worn. Windows dirty, cobwebs, garden partly overgrown. New bedding needed. This is a very remote location so local facilities are very limited, but the local shop is well stocked. I would describe this property as shabby chic but acceptable. It is beginning to show its age. It could have been cleaner around the edges, especially in the bathroom. The area is fantastic for exploring and relaxing. We had a glorious few days weather wise which meant we didn't spend that much time in the lodge. We had a great walk up Ben Hiant, walked down to the ferry over to Tobermoray and visited the lighthouse and Sanna Bay. Enjoyed having a pub within walking distance too. The lodge was well appointed with plenty of puzzles and books for indoor days, not that we had any! The views are stunning - out back there's a hill and some friendly sheep, whilst at the front there's a great view down to the sea. I would say the lodge could be a bit cleaner, but apart from that, all good. We had an enjoyable holiday at Ian's Lodge however this was due to the fantastic location of the lodge which is set in a beautiful part of the country. We arrived in darkness and the lodge was quite difficult to find. Unfortunately the bed wasn't made up and there were no linens left for us to do it ourselves despite requesting this at the time of booking. To be fair this was rectified the next day when we were handed sheets to make the bed up ourselves but had to tumble dry them for a while due to dampness. The lodge itself was not cleaned prior to our arrival and again I had to do this myself as my partner really, really, did not want to stay there. It took some persuasion on my part which kind of put a dampener on our stay, it's not something you envision having to do when you go for a break! There was an overpowering smell in the kitchen which was difficult to identify, we suspect something may have died behind one of the kickboards in the kitchen, we didn't investigate because that would have been the end of our holiday! The TV didn't work and the shower had no water pressure but thankfully there was a bath. The location was fantastic and we saw some amazing wildlife during our trip which made up for the disappointment of the accommodation - just! The house overall needs better cleaned as we found it all quite dirty, I thought it could also be in need of a freshen up . We spent 4 nights at £400.00 which is perhaps a bit overpriced for the time of the season and the standard of the accommodation. We have stayed at other lodges namely Comraich which is of a better standard. It was such a lovely weekend and the accommodation was great. A wonderful place to go for a weekend and catch up with old friends. We love to stay in Scotland and have done so many times over the years, this was the first time with steading holidays. Just love this property, hence why the quick return to Ardnamuchan. I feel very at home in this property, even on a rainy day the view and the activity of the boats that go up and down the water is so interesting. The location just perfect for walking, going to the shop and the pub.Can't wait to return. wonderful. A real home from home. Well equipped, with beautiful views over the Sound of Mull. Set high on the hillside with a short walk to the local amenities, Pub/Hotel, Café, Tourist Information Centre and Post Office. A great base to explore the Ardnamurcharan peninsula with The Lighthouse, Sanna Bay, and the Ferry to Mull on your doorstep. Wildlife a plenty, this place was perfect for a relaxing break away from it all. Hope to come back some day soon. Had another great week in Ardnamuchan in this lovely house, glad to see the new washing line up but can hardly get to it for shurbs and flowers. Requested that this area should have been dealt with last year but it does not deviate from the fact that it is a lovely situated chalet, enjoyed it so much I have rebooked for September. Hope the weather is good to us again but not likely but it will be enjoyable no matter what. very good, love The Ferry Stores especially the Pakora !!! My wife and I have stayed in this property several times and it is still the preferred location. The lodge is warm and well-equipped and, as a bonus, the electricity charges are now included in the weekly rental and so there are no nasty surprises at the end of your stay in the way of a high charge for power. The lodge has been standing for a few years now and, since the entire construction is of wood, one needs to be aware that it is not quite as "rock-solid" as a bricks-and-mortar construction and so on e needs to be aware that things may not be perfect. However, the little idiosyncrasies associated with the type of construction will not mar a very comfortable stay. The heating is more than adequate, the kitchen is well equipped, the bathroom leaves nothing to be desired (unless you insist on the use of a bidet, in which case, you will need to bring your own). It is ideal for a family and, as another bonus, that includes your dog and the local shop (in fact, the only shop) is only a mile away. The staff at Steading Holidays are usually around and, if they are not, there is a property manager living not too far away and who is contactable by 'phone. Should you notice that anything is amiss, it will be dealt with promptly so long as you tell someone at the time and not at the end of your stay. I love the place and I intend to continue using on a regular basis until I can no longer make the journey (540 miles). I ought to add that I am a man of relatively simple needs and, not to say that I am easily pleased, but that I do not usually live a life in luxurious surroundings but I cannot see how this property can be improved. I hope that you will seriously consider this property if you are ever on the Ardnamurchan peninsula as I believe that you will not be disappointed. Considering the remoteness of the location, I found them to be more than adequate. It should be pointed out that the local shop, "Ferry Stores" tends to be expensive and some of their stock is old (beware of buying anything that has batteries included - I wasn't and it cost me £8.00 because the batteries had leaked and the item was useless). Do as much of your shopping, particularly the non-perishable items at Fort William or at some other place in order to keep the costs down. Our stay at Ian's lodge was comfortable and cosy and the a frame cabin felt much more spacious than we had expected. The kids loved it, the views and weather were spectacular, and the bird song was just so beautiful. Lovely destination, great for exploring the west of the peninsula. we will all remember it for a long time to come. As expected, good for the location. We took in all our food but the local Kilchoan hotel was lovely and we would eat there again. I would recommend the peace and tranquility of a christmas spent here to anyone but be careful to prepare for the West Coast climate.The cabins are predominantly summer lets and whilst all you will need to enjoy your stay is to hand,there is no escaping what nature will inevitably provide. Bathroom very poor compared to other properties I have used in this price range, the rest of the property was fine, although some of the furnishings were rather worn and tatty. When staying at Ian’s Lodge it is essential for safety reason to have a working mobile phone as there is no land line in the property. The potential threat to life and property is totally unacceptable. I do not remember seeing any warning of this danger in the property description when booking. With no phone line the property does not have access to the internet which in this standard of property is expected by occupants who need contact with business and the World. The incredible view is blighted by scrub bushes at the front of the property. The property has a TV in name only as it is so small and with its indoor aerial which constantly needs retuning is impossible to view in comfort. Some kitchen utensils’ are of a poor standard which include a spilling when poring kettle. A completely erratic toaster and knives so blunt butter has no fear of them. We booked Ian’s Lodge as the excellent property we stayed in last year (Chris’s Ranch) was not available so expecting a similar standard we booked. Please view my comments in a positive way hopefully encouraging the owner to invest in the property making it the truly excellent experience that it could so easily become for this beautiful area. Hi Brian, thanks for your feedback and suggestions following your stay at Ian's Lodge. We've passed these onto the owner and they are going to take remedial action to inprove the facilities in the house and asked me to thank you for your useful comments. Had a marvelous week in Ian's, have been before so knew what to expect but there are definate improvements i.e. new doors on the balcony and front doors. Glad to see that the hole that the birds were nesting in was blocked off. Did all the walking from the front door- always a bonus. Had reported that there could be more kitchen equipment, no sugar bowl, measuring jug, no outside facilities for drying clothes outside but created our own. Found the microwave dirty and the tumble dryer also but sorted that ourselves also. Met the owner personally and have given her these point + cutting the side hedge back as it spoils the view. Can I also mention as I do every visit, please cut the trees back a little as the views are stunning, not asking you to chop them down be cut them back to keep the stunning views as one of the reasons I keep coming back to you. Had a lovely week in Kilchoan with my other half in march/april. The only downside is the heating!! There was never enough hot water and as we found out at the end of the week when we looked at how much the electricity would cost, it was also very expensive to heat. The house uses storage heaters which are very difficult to alter the settings and we were cold pretty much all week Which meant there was lots of wrapping up! Overall we spent arround £40 for the week which wouldn't have been so bad if there was enough hot water and the lodge was warm. Overall I really enjoyed our stay here but it may be an idea to go during the summer months. Love the area and this lodge. Great views, spacious and free-range environs. I am 6'2" tall and can bump into some beams here, so we might try another house at Steading Hols next time. The property provides comfortable accommodation, in a stunning part of Scotland, for three or four people. My wife complained about the comfort of the bed but I found it OK. Perhaps it is because we have a Queen's size bed at home with a memory foam mattress! My main complaint is that the television is not big enough for the few occasions that we watched some programmes and a couple of DVDs. The property is well positioned for walking to the Community Centre, Pub and the village shop. It is also very convenient for the ferry to Mull (Tobermory) where we went for a great day's cycling. Ian's Lodge also backs straight on to the fell and there is a convenient stile just behind the property so it is ideal for walking the dog or wandering up the low hills behind where you get stunning views of the Sound of Mull and Mull itself where you can pick out Glengorm Castle on the other side. A relaxed, get away from it all, autumn break. The photo shows the view back to Kilchoan after we'd walked about a mile to the end of the road around the bay, stunning views. Friendly staff and customers in the bar of the Kilchoan Hotel and decent food if you want to eat out. The accommodation was a bit chilly in the evening (October) but was well equipped. The Ferry Stores was an OK 'corner shop' a bit expensive so take what you can with you. Be prepared for the slow-ish driving on one track roads, but a trip North to Sanna beach is well worth it. We had a wonderfully relaxing week but teenagers would probably be bored so leave them with grandma as we did. Booked at the last minute but a success. Recommended. More spacious than you might think. Peaceful with great outlook to Mull. Steading Holidays very helpful and efficient.